Five years ago, I was a college freshman. I remember entering the DLSU campus for the first time and feeling really intimidated by all these people who've got their grooves going. Then again, I was looking at the juniors and the seniors. Then again, my fellow freshmen didn't seem to need more adjusting than I did. Five years after, I'm a college graduate. It's been two and a half years since I received my diploma. I'm considerably better-adjusted now, and as a slightly productive member of the workforce I'm going through the same things as everybody else: wondering whether there's something beyond where we are, or beyond the limitations of our wallets. And, like everybody else, I'm hoping that I could be a student again, and not care as much as I have to now. The least we could do is return to our school once in a while, preferably with friends, reminiscing about the good old times. Alumni homecoming, check - but that's often too structured and formal, not that I've been to one. But the end result's the same: you end up returning to college and feeling alienated all over again, like you were as a freshman. Or maybe it was just me. I've been back to DLSU three times since I graduated. There was the prerequisite return-your-toga-and-claim-your-graduation-photos day, a week after we graduated. There was when I took a leave from work to work on Shale Campaigns. And then there was last night, when I left work - at the usual time, note - only to take two trains rather than one shuttle, to return to my alma mater and enjoy some company. The first thing I did was send a text message to Gwen. "I'm lost in my own alma mater," I said. I still knew my way, but I felt really lost. Well, it's more of, I didn't really know why I was on campus. Yes, I know Krizzie invited me to this little event that she's been taking care of for months now. We almost met during the miting de avance a year ago: I was starstruck ("it's the Krizzie Syfu!") and she was starstruck ("it's the Shale Campaigns guy!") and nothing happened until she found my photos and we began talking. "I hope I could meet you again next time, though," she once told me, "on a much, umm... appropriate circumstance for meeting. Not just on the [amphitheater] while everyone was busy!" She did invite me before, to the send-off event for the football field, which was giving way to another building. It happened on a Thursday, and it was expected to be an all-night affair, so I begged off. Looking back, it's unusual why I didn't beg off this time. Ating Gabi, this little showcase of talents from the CLA, was also on a Thursday - only it wasn't an all-night affair. Or at least not supposed to be one. It was supposed to end at half past eight, but I ended up leaving an hour later. The irony was, it wasn't really what she considered a more appropriate circumstance for meeting. Sure, people weren't on the amphitheater being busy - but only because people were being busy at the Central Plaza. Being the head honcho of the event - inevitable when you're president of what is now called the Arts College Government - Krizzie was out and about, acting as gracious host and frazzled organizer, giving away sushi (which I didn't have) and makeshift VIP bracelets made of strips of neon green sticker paper (which I had). The only time we really talked was when I said goodbye, and the only conversation we had was the usual "thank you for coming!" bit. And, earlier, something about one of the better performers. So, I ended up spending most of my time alone, taking photographs of performances that I'll probably forget soon because I don't really know who's performing. I didn't know anyone apart from Krizzie and the DO people and Mang Ric, who toured me around the expanded television studio earlier than night. It felt weird, being surrounded by ID 109 and ID 110 students, and feeling really intimidated by them - much like when I was a college freshman. I know, I know, it's just me. Here's a forced observation: the same stereotypes hound any college generation. I know, I've mentioned this before - but it's much more striking when you see them in school, as opposed to the mall. There's always this half-Chinese student who dresses really neatly and sounds like she spends her weekends getting drunk and partying. There's always this small, round person with glasses who looks really responsible and really quiet. There's always this foreign-looking guy with a really Filipino sense of humor. There's always this large, quiet woman who's just going through things steadily. I swear I even saw someone like John, complete with striped polo shirt - only the person has a laptop. 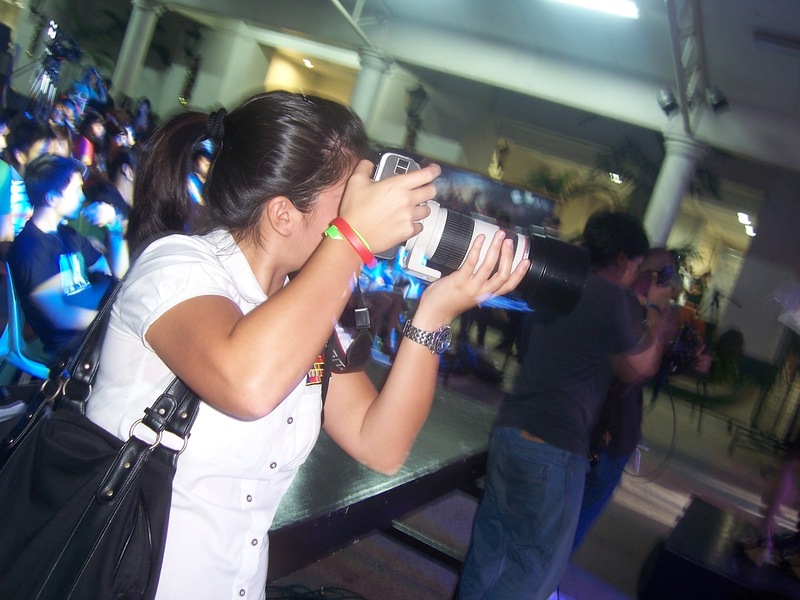 And there I was, watching from the sidelines, wearing a makeshift VIP bracelet and acting as if I know what I'm doing, actually not knowing what I'm doing. I see all these kids with DSLRs and plaid jackets, and I feel really, really old - and slightly bad, considering that they didn't need that much adjusting as opposed to me. Or maybe I just felt really old. I was, I think, the only ID 105 student watching. If Chris didn't have to go to work he'd carry the burden of being the only ID 104 student watching - but then we'd talk about Brenda Lowe. Thankfully, I still had company. I was supposed to go with Michelle, someone who I barely talked to when we were students, but whose name I knew very well, partly because Les often mentioned her in the same breath as Krizzie. We did chat during the miting de avance as if we've known each other for ages. It's with the same perspective that I invited her to go with me to Ating Gabi: after all, she was also invited, and she also worked in Ortigas. But she's in a much better place than I am, which meant she had to go overtime, which meant I had to ride the trains alone. But we still spent most of the night together. Well, in between her taking photographs with her DSLR, and a few other conversations in between. She once floated the idea of going as my so-called "date", but I guess the idea fizzled when Janelle, the other so-called "date", failed to arrive. (I later told her I was sort of looking forward to have a photo with her. There was a photo booth. I haven't been in one.) Still, we spent most of the time shouting at each other - we unfortunately stood beside the speakers - bashing the worse performers. "They're singing clichéd pop songs." "Stop singing! You're out of tune!" "The guy's more out of tune." "Really! Stop singing! You're out of tune!" "Why are you reading the lyrics? You don't know the song?" "You should stick with being DJs!" "This is painful. They're singing together but I can still hear him." "I'm sorry, Michelle. I can't hear you. I can only hear him." "He's no Cory Monteith. And he doesn't sing that well, to boot." I guess, being graduates, we have the license to be really snarky to the students who purportedly have talent. To their credit, they do - but the young ones often are diamonds in the rough, and since we work in the media, we know what we are talking about. (Shoehorned Glee reference: Dianna Agron's fake crying is painfully wonderful. I rest my case.) But we'd also talk about where we've been to since graduation, and all of our frustrations with being alumni rather than potential alumni. We wished we were back, but sometimes there's no better place than being out of it, reminiscing, making real progress as opposed to preparing for it. Of course, that's subjective - I've been doing the same thing for two and a half years and I'm finding it difficult to say I've moved forward. Krizzie, on the other hand, is in her fifth year in college - I'm not sure if I have my math right - but she's poised for better things than I ever will be. Or maybe it's just me. Right, the acts that followed that guy who can't sing, the YouTube sensations, as the hosts are bent to drill down our necks. They are much better, those YouTube sensations, save for the bad audio mixing. Them, and the beatboxers, and the soul kids who ended up being the last act. It's not just me. More or less I'm stating the facts, right? College is a time warp. That is definitely fact. I wasn't the only ID 105 student around. Ian was there, headphones over his shaved head, fancy video camera in his hands, doing what he later described as "hand-aching stuff". EJ was also there - I knew he'd be there, since Krizzie mentioned that he was also in her guest list - and, after exchanging the usual pleasantries, he gave me a slightly tattered but still fairly fancy business card. Frankly, I didn't really mind whether I was alone or not - the fact that this is a different circle of people, the folks I met mostly through extra-curricular means, speaks for itself. The fact that I didn't feel awkward, even acting like we're just catching up? Maybe I'm just at par with everyone else, and I'm slightly exaggerating things. Slightly, mind, because I don't normally do beso-beso with people. But hugs were completely inappropriate, so I said goodbye to Michelle like that, and I said goodbye to Krizzie like that. And I walked out of campus, and wondered what I went to school for. My last exchange with Michelle was ringing in my head. "Was it worth your time?" she asked, and I merely shrugged, saying I needed the distraction. And, yes, I needed the company. Gwen answered me a few hours later. Turns out she was in campus, eating with her friends, not able to reply because, as she argued, "when people eat, it should be above everything else!" Another missed opportunity for a meet-up, but that's what time warps tend to do.